Supervision assures the quality of professional practice through careful monitoring; it heals wounds through wholesome listening and support and offers a unique and free space to develop that which we all want to progress: our personal relationships. A detailed introduction to the ethics of supervision. 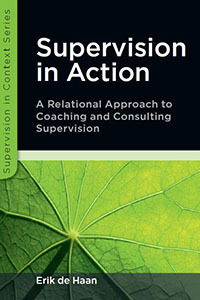 Supervision in Action is a book for all professional consultants who want to take good care of themselves and who want to help other consultants and coaches with the care for the self.